We can try to resist as much as we like, but none of us is immune to the snake-oil charms of marketing. The fact that an object (a salt cellar! A pair of jeans! Shampoo!) has a label or a logo on it somehow imbues it with some magical added value. It’s largely bogus, of course, but we can still fall for it. In some cases, a brand name has credibility because the company has a long history and a hard-won reputation for producing the goods and knowing what it’s doing. In cycling, one such name is Bianchi. The Bergamo-based company was founded in 1885 by Eduardo Bianchi and claims — reasonably — to be the oldest surviving bicycle manufacturer in the world. 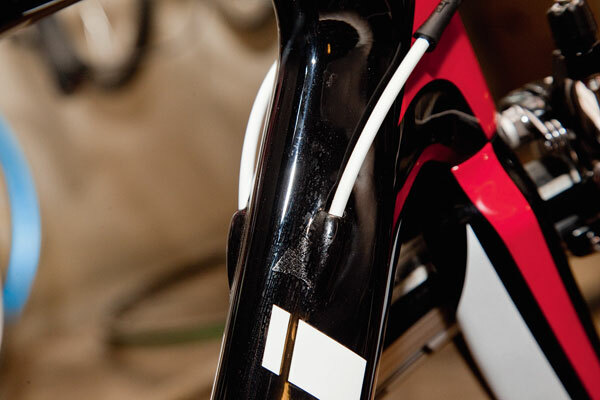 Bianchi bikes have been associated with some of the most famous names and moments in racing history. Even if the names of Fausto Coppi, Felice Gimondi and Marco Pantani don’t mean anything to you, you can be assured that, over the decades, input from some of the world’s best riders has found its way into Bianchi designs. Which is a long-winded way of saying that this Vertigo is a sweet-handling, good-natured bike that you could ride from Lombardy to Loch Lomond and still feel fresh. It looks like a ‘racer’ and it pretty much rides like a ‘racer’ but with added comfort engineered in. If you are looking for the stiffest and least forgiving frameset on the road, this is not it. Which is absolutely not a bad thing. The carbon monocoque frame has been designed with comfort at the top of the must-have list. 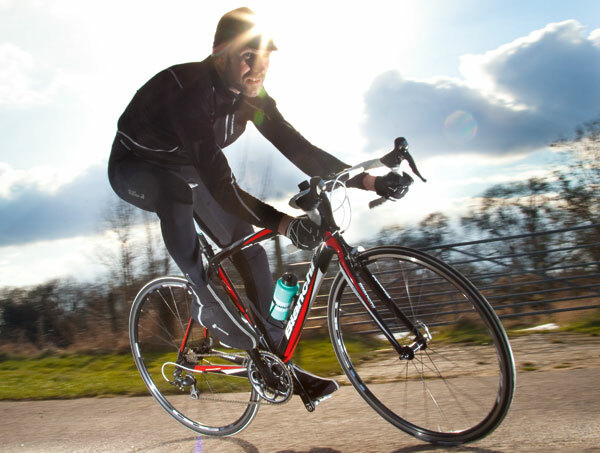 It’s all very well looking for a rigid and unyielding frame if you are a full-time bike rider and your body is accustomed to taking a beating every time you cycle. If you’re not, why put yourself through the post-ride, next-morning ache-fest? If you’ve been used to riding a bike with an on-trend, oversized, tapered headstock and fork crown, you’ll notice that a lot less road buzz gets through to your hands — that’s because the front-end of the Vertigo is a more finely sculpted affair. In fact, the frame and fork both offer a more cosseted ride; they are mated to a Shimano WH-500 wheelset and fat Hutchinson Equinox 2 tyres, which absorb vibrations on rougher roads. Some modern bikes have front ends (headstock and forks) that hit bumps and ripples in the road like a powerboat smacking a wave — they just hit it, skim over it and plough on. The Bianchi’s front end is more like a surfboard being paddled out to a break; it seems to rise and fall with the waves, more riding the crest than battering both self and rider. That’s an exaggeration, of course, but you get the general idea. The overall comfort of the ride is helped by a rather more relaxed C2C geometry than on Bianchi’s racier frames. The combination of more laid-back head and seat angles allied to a slightly more stretched-out wheelbase adds up to handling that’s lively and responsive without ever reacting to your input like a nervous racehorse. The combination of frame construction and geometry makes this a bike that’s very easy to get on with and just… ride. The components on the bike are spot-on for this price-range. It’s rare that you find Shimano 105 cranks and geartrain as well as a wheelset, and the shifting is a slick step above the mix ’n’ match options you often find on bikes this price. The San Marco Ponza saddle is a decent touch, while the costs have been kept down with the own-brand Reparto Corse stem, non-ergo bars, seatpost and brakes. 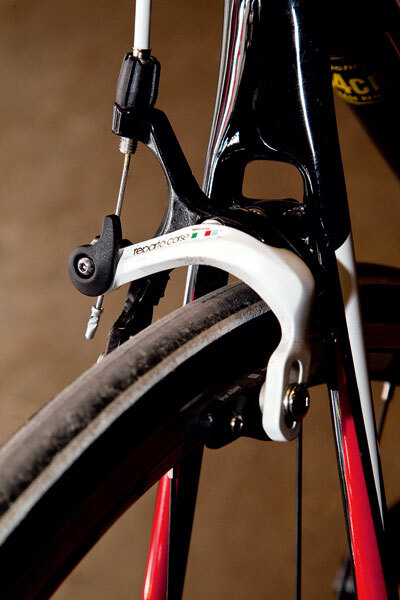 The brakes might look pretty, but they felt rather wooden — some initial bite but not much more, regardless of how much harder you squeezed those nicely sculpted Shimano 105 levers. For those who still believe that stiffness or rigidity is the one true way for a road bike frame, well, walk away now. On the other hand, for those sportive riders who don’t enjoy having their fillings rattled out or bouncing sideways, this bike is worth throwing a leg over. Newcomers who fancy a slice of cycling history but don’t want to suffer for the privilege should book a test ride and start practising essential Italian — Vai, non è lontano! 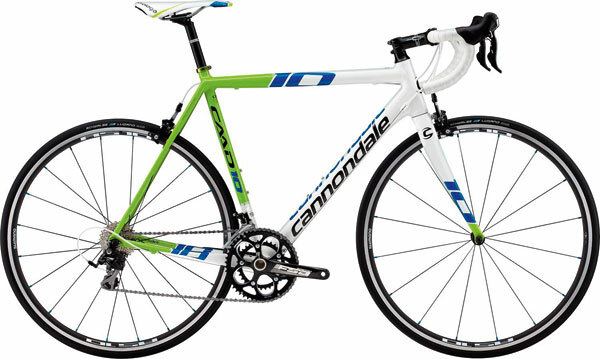 If Bianchi is old, then Cannondale is a thrusting young brand from the new world — Bethel, Pennsylvania, to be precise. In the Eighties, Cannondale was one of the original trailblazers when it came to making oversize-tubed aluminium frames and this is a fine example of its art. This frame is 6069 aluminium alloy, the fork is full carbon, the head tube is tapered and the geometry is a tad racier, though the finishing spec is broadly similar.